Satisfy your inner culture vulture at La Rocca and Chiesa del Gesu. Your inner history buff will appreciate Castello di Vicari and Oratorio del Santissimo Sacramento. Explore Palermo's surroundings by going to Duomo di Monreale (in Monreale), Cefalu (Cefalu Coast, Duomo di Cefalu, & more) and Tempio di Segesta (in Calatafimi-Segesta). There's much more to do: delve into the distant past at Parco Archeologico di Selinunte, admire the landmark architecture of Norman Palace and Palatine Chapel, and contemplate in the serene atmosphere at Santa Maria dell'Ammiraglio. For more things to do, ratings, reviews, and other tourist information, go to the Palermo day trip planning app . Denver, USA to Palermo is an approximately 19.5-hour flight. You can also do a combination of flight and bus. The time zone difference when traveling from Denver to Palermo is 8 hours. Wrap up your sightseeing on the 12th (Fri) early enough to travel to Naples. Naples is the capital of the Italian region Campania and the third-largest municipality in Italy after Rome and Milan. On the 13th (Sat), delve into the distant past at Ruins of Herculaneum, then examine the collection at National Archaeological Museum of Naples, and then steep yourself in history at Underground Naples. Get ready for a full day of sightseeing on the 14th (Sun): delve into the distant past at Catacombe di San Gennaro, contemplate in the serene atmosphere at Gesu Nuovo Church, then explore the historical opulence of Castel dell'Ovo, then don't miss a visit to Galleria Borbonica, and finally appreciate the extensive heritage of Via Caracciolo e Lungomare di Napoli. To see reviews, more things to do, traveler tips, and other tourist information, go to the Naples day trip planner. Traveling by flight from Palermo to Naples takes 4 hours. Alternatively, you can do a combination of bus and flight; or ride a ferry. In April, plan for daily highs up to 68°F, and evening lows to 52°F. Cap off your sightseeing on the 14th (Sun) early enough to go by car to Orvieto. 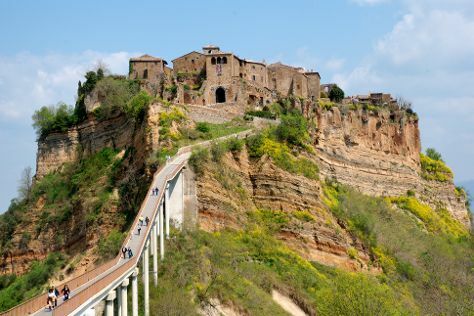 Kick off your visit on the 15th (Mon): make a trip to Pozzo di San Patrizio, then wander the streets of Civita di Bagnoregio, then take in the architecture and atmosphere at Abbey of Saints Severus and Martyrius, and finally take in the architecture and atmosphere at Chiesa San Giovenale. Get ready for a full day of sightseeing on the next day: wander the streets of Borgo Roccalvecce, see a world frozen in time at Centro Storico di Celleno Vecchia, then contemplate the long history of Duomo di Orvieto, then appreciate the extensive heritage of Centro Storico Orvieto, and finally take in the architecture and atmosphere at Chiesa S. Andrea. To find photos, other places to visit, traveler tips, and more tourist information, go to the Orvieto sightseeing planner . You can drive from Naples to Orvieto in 3.5 hours. Other options are to take a train; or take a bus. Expect slightly colder evenings in Orvieto when traveling from Naples in April, with lows around 46°F. Finish your sightseeing early on the 16th (Tue) so you can drive to Assisi. Start off your visit on the 17th (Wed): take in the spiritual surroundings of Cripta di San Francesco, contemplate in the serene atmosphere at Basilica di Santa Chiara, pause for some serene contemplation at Basilica Superiore di San Francesco d' Assisi, then take in the architecture and atmosphere at Cattedrale di Santa Maria Assunta Spoleto, and finally steep yourself in history at San Damiano. Get ready for a full day of sightseeing on the 18th (Thu): make a trip to Eremo delle Carceri, appreciate the extensive heritage of Strada Assisi-Santa Maria degli Angeli, get to know the fascinating history of Centro Storico, take in the architecture and atmosphere at Chiesa Santo Stefano, then see the interesting displays at Museo della Porziuncola, and finally take in the architecture and atmosphere at Basilica di Santa Maria degli Angeli - Porziuncola. For reviews, other places to visit, and more tourist information, read our Assisi planner . Drive from Orvieto to Assisi in 1.5 hours. Alternatively, you can take a train; or take a bus. In April in Assisi, expect temperatures between 67°F during the day and 45°F at night. Wrap up your sightseeing on the 18th (Thu) to allow time to drive to Venice. 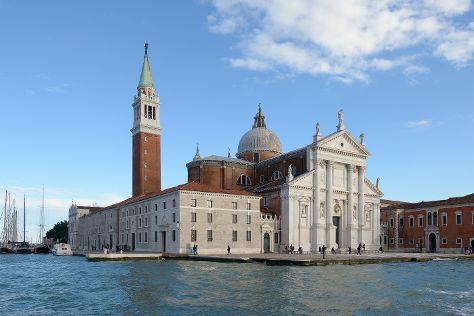 Get some historical perspective at San Giorgio Maggiore and Scuola Grande di San Rocco. Get a sense of the local culture at Basilica Santa Maria Gloriosa dei Frari and Centro Storico di Venezia. You'll find plenty of places to visit near Venice: Padua (Scrovegni Chapel & Basilica di Sant’Antonio). The adventure continues: take a stroll through Dorsoduro, take in the architecture and atmosphere at Basilica di Santa Maria della Salute, and take in the views from Ponte dei Sospiri. For traveler tips, photos, maps, and other tourist information, refer to the Venice trip itinerary tool . Getting from Assisi to Venice by car takes about 4.5 hours. Other options: take a train; or do a combination of train and flight. In April, daily temperatures in Venice can reach 65°F, while at night they dip to 49°F. Wrap up your sightseeing by early afternoon on the 21st (Sun) to allow time for travel back home.